If you live in Avon, Indianapolis, Plainfield, or any of the surrounding Indiana communities, and you’re looking for an oil change near you, then congratulations…you’ve found it! Welcome to the Toyota service department! 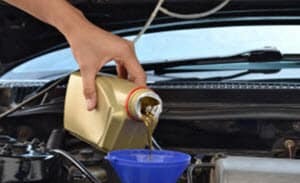 Our technicians are known as some of the best oil change experts in the entire state. We can’t put enough emphasis on the importance of getting a regular oil change. It enables your car’s engine to run smoothly, efficiently, and safely. Call, click, or come by to schedule an appointment now. But how do I know if my Toyota needs an oil change? There are a few telltale signs that indicate when your Toyota (or other make) is ready for an oil change. Look for either its check engine light or its oil change indicator. Manually evaluate your motor oil levels using the dipstick. Be wary of oil that’s black or gritty in consistency. Listen for any unusual engine noises while driving. When is the last time you’ve had your oil changed? If you can’t remember, then it’s surely time! Browse this list, and don’t hesitate to contact us at Andy Mohr Toyota if your vehicle is ready for service. The guys and gals on our team are courteous and effective. As a team, they probably perform thousands of oil changes per year, which means that they’ll approach your vehicle with a professional attitude. Best of all they’re capable of much more than just oil changes. If you’re having any other sorts of Toyota issues, they’ll sort them out—flat tires, faulty lights, busted transmissions, broken engines, etc., etc., etc. Schedule your oil change today at Andy Mohr Toyota: Just contact us! It’s very simple to schedule your service appointment, especially if you’re near Plainfield, Indianapolis, or Avon—just call us on the phone, get in touch with us on our website, or stop by our showroom now. We won’t hesitate to address your motor oil, nor any of your other automotive needs.